You literally won't find me on a plane without these things. You can find similar alternatives to this little cord keeper, and any of them will do. But I will so that I love grabbing my headphones and not spending 15 minutes sorting out the tangles every time I want to use them. I'll never forget the day I invented this. I was sick of buying bottles of water when I was out, but also sick of carrying around a HUGE reusable canteen or Nalgene just incase I was thirsty. I thought to myself, "What if there was a re-usable Capri Sun type bottle that I could fill up with water, and leave flat in my purse when I wasn't using it?!" I swore I was going to be a millionaire.... until I googled it and found out it was already invented. Dang it. Well, if I'm not going to be rich, I'm just glad it's already a thing, because I use it constantly. I got mine on Amazon (certain colors go on sale from time to time). I've found that being short on airplanes comes at an advantage & a disadvantage. The advantage? Leg room is not an issue for me. However, my head is always being pushed forward/down by the headrest, because it's where everyone else's necks are. A neck pillow seemed like a nice option, but the inflatable ones were sticky plastic and the plush ones took up too much space... so I just skipped it. UNTIL I found this great set at West Elm! The jersey knit cover makes it soft, but the pillow itself is a blow up... best of both worlds! It's awesome. The West Elm set is sold out, but here's a similar one. I never thought I'd get an iPad, especially a mini one (I'm definitely one of those people who thought they were just oversized phones), but I'm so glad we have it. On trips where we're only doing light work, we just use that instead of hauling a laptop. Plus, the iPad can have books, movies, magazines (all Condé Nast magazines include a free digital subscription! ), and the battery lasts forever. We load it up with movie rentals from Amazon & use the Smart Case to prop it up. The Smart Case was a non negotiable to me when we decided on getting an iPad. But, we're cheap, so we got one off eBay that came with a hard case for the back, too. So there you have it! Those are my essentials. 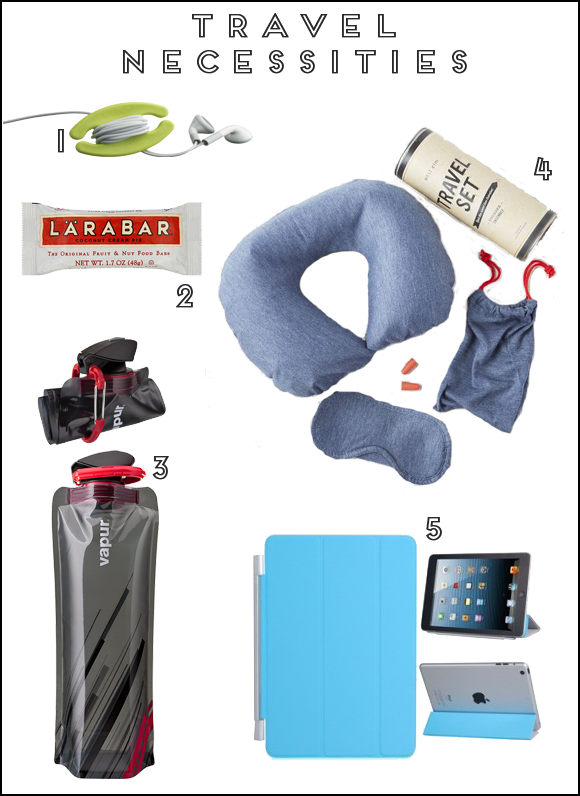 Do you use any of these when you travel? Think it's over the top? What are your must-haves?